2019 Season: From mid-November through mid-December, one owl (female?) used the nest box as a day roost, before shifting to the palm tree where the male has been roosting. During December and January we were interested to see the owls actively defending the vicinity of the nest box by "buzzing" any squirrel which approached this section of the nest tree. Several times, the owls managed to actually knock a squirrel off its branch (squirrels bounced up unhurt from the 30-foot fall!). Feb 13 Female occupied nest box. Feb 18 First of four eggs seen. Mar 17 First hatching expected. 6:25am, bug drop by the male. As the birds wake up the modest rasping from the nestlings quiets. The fledglings are hard to hear and are gradually out rasped by the three blue jay fledglings in the crepe myrtle. The parents are working hard finding food for the. They seem to have formed a morning truce with the owls—no mobbing, no chittering. The adult owls, though, are bill-clapping at the many squirrels and even the doves. The cardinals are now tuning up—downright noisy out here today. 9:50am, Glanced at the camera and saw three owls in the box. Huh. The soft descending trills made me think it was the female. So I grabbed the binoculars and headed for the shop stairs, the best viewing spot. Again, watching her flight, I located the rest of the family. This is the first time seeing all 4 out of the box: both fledglings, Madame and Papa up high in the oak over the driveway. PM, warmed to 80, reactivating all the mosquitoes. T=79 at 7pm. Sunny, light breeze. Nestlings in the box are getting restless. 7:00pm, Well, for Pete’s sake! An owlet just fledged! Jumped right out into the world in the broad, sunny daylight. I was inside so saw it on the monitor but didn’t see the direction of flight. I was out staring around trying to locate the rascal when T got home on his bicycle. We are nonplussed. The remaining sibling is peering out, not at all happy and certainly not about to take that same insane leap. 7:20pm, New fledge didn’t loose any altitude in his/her maiden flight. He is up there rasping with abandon, bobbing enthusiastically as he located his fledged sibs way up in the oak. He is making his way in their direction. 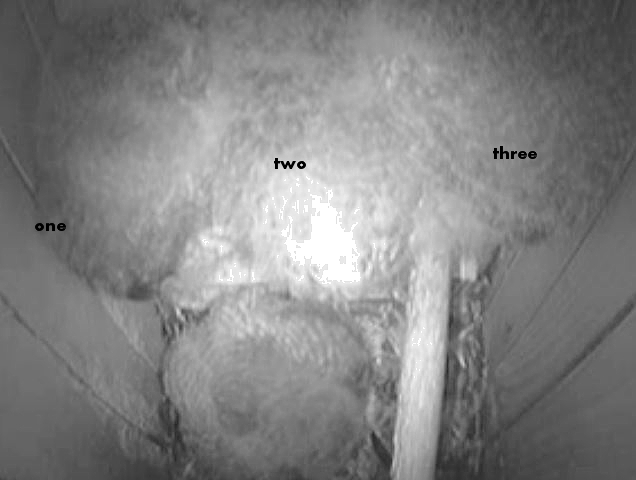 Remaining owlet is really bummed, has retreated to the very bottom of the box, facing the wall. Hasn’t moved in nearly 20 minutes. 8pm, rasping all round. And there goes the last nestling, finally taking the jump to adolescence! Parents are hunting from their familiar driveway spots; mostly insects and ground based prey. Quite a bit of moving around, hopping and short flights. One very ambitious one has flown after a parent, overhead, through the gap to the backyard pecan, like a blooming bomber. His stubby excuse for a tail will not help much as a rudder. 8:30pm, starting to calm down in the rasping and feeding department. Two of the owlets have followed a parent to the backyard pecan; another parent is staying around the two in the driveway oak. 9pm, all quiet. Still separated into two groups? AM, T = 53° at 6 AM, clear and gorgeous. 6:30 AM, rasping from the box and from someone up in the oak across the driveway. That would be the owlets in the nest box and one of the fledged owlets across the driveway. 7:10 AM, an adult owl was mobbed into the box by jays. Watching her fly out again helped me to locate her day roost near to one of the owlets. That one is way up in the oak tree, high enough to be catching the morning sun and basking. One of the vigilant adults chased away a whitewing dove that was too close to the nest box. One fledgling stayed in its high, windy perch the entire morning and afternoon. I can’t find the other one. The evening was windless, with a waxing moon illuminating the scene. Two owlets in the nest box, still. At 8:10 PM. Faint, descending trills (food-begging calls) could be heard from the female parent, somewhere in the oak tree west of the nest box. Presumably she is sharing this tree with one or both of the fledglings. 8:15 PM., Food-begging rasps from a fledgling could be heard coming from this tree. Between 8:15 PM and 8:30 PM both parents showed up near the nest box and, to my surprise, one of the fledglings also appeared, close to the adults and within 6 feet of the nest box. We speculated that this was the older fledgling, now with sufficiently good flight skills to follow Mom back and forth across the driveway. The parents behaved in an interesting way, landing on the external perch of the nest box, but then turning their backs on the two nestlings peering from the entrance. In one case, one of the adults was holding an insect and, instead of feeding it to the nestlings in the entrance, the adult departed in the direction of the rasping fledgling in the nearby oak. Had the impression several times that adults were parking on branches 5 to 10 feet from the nest box and in clear view of the nestlings, trying to encourage them to fledge. 10 PM, nobody has fledged. 10:12 PM, amazing sight! The female entered the nest box carrying a bird. She got down on the floor and gave her typical, high-pitched cluck, which has always been used to advertise food and to coax eating behavior. Then – she picked up the bird and left! We think this was a clear example of food display to encourage fledging. 6 am, The fledgling is up by the boy box, over the roof of the house. In the dawn, after T rode away, I stood quietly by the car, listening to the muted but constant descending trills of the female (? ), sitting 10 ft to my right on a low branch of the crepe myrtle. The male, hunting, was first 10 ft on my left, by the porch, then hunting over on the fence, head down. Gone most of the day, so didn’t see owls again until 5pm. The fledgling was higher in the tree, as is usual on the first day. Couldn’t locate either parent, not even when a particularly vicious jay made jabbing runs right at the owlet. T saw downy fluff on the leaves surrounding it. Though we would prefer more vigilent parenting, at least we don’t get buzzed by them ourselves. PM, cold front has come through; somber grey, north wind, T=62 and falling. 8pm, we position ourselves outside tonight, hoping to see another fledging, having missed it last night in all the excitement of transfering a bee swarm to a new home. The owlets, so quiet all day, were getting restless, competing for the entrance hole. 8:30pm, there have been 4 bug deliveries to the nestbox; a flurry followed by a long quiet spell. By 8:45 pm we gave up and went inside; whereupon fledgling #2 launched. Dang. I stood out by the garage but not a glimpse of owlet movement did I see. 9:30pm, quiet again in the nestbox. No sound from the fledglings; but no sounds of distress from the parents, so that’s good. 9:50pm, F brings something large in through the entrance and proceeds to crunch it up and feed it to the enthusiastic remaining owlets. Rip and tear, rip and tear; crunch, crunch. A bird or a rat, most likely. This really doesn’t fit with the fledging model of withholding food temptingly outside of the entrance to encourage leaving the security of the nest. Instead she seems to be encouraging them to stay where they are. And what are the fledglings on the outside getting?? 10:10pm, still tearing and feeding. One owlet is stuffed, head down. 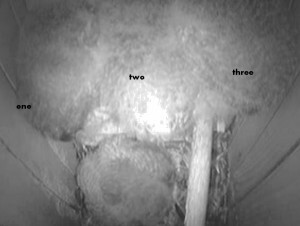 10:20pm, last owlet quits begging, full at last. F moves to the entrance. AM, T=60, clear, light wind, lovely morning. 6:35am, first one, then two, then 3 owlets have struggled up to the entrance hole for a view of the marvelous bright world outside the box. The young bluejays have fledged. I can locate two of the four, still looking for the others. They have surprising strength, given the pitiful stumps of tails. 8:19am, F finally back in the box for a while. Much wing flapping by the owlets. The oldest ones are starting to show interest in climbing—grabbing the internal ladder with beaks and pulling, etc. They are sort of like parrots in this regard. 10:40am, F left the box for a little peace and quiet outside. 2:12pm, F returned to the box, muttering about hunger. 5:50pm, a bug delivery from the male! He has left his perch early to get hunting. Now robins are mobbing around the bamboo by the compost heap. Still raining and the M is sheltering on the dry, top corner of a window next door. This male likes protected perches—like the top of the pillar on our front porch, and under the eaves where the wires come into the house. 7:15pm, F out hunting, too. Neither parent is around until 7:40am, well past dawn and daytime bird activity. The M wasn’t yet in his perch though we heard his trill outside the box just after the F returned, foodless. He went to his roost at 7:50am. This is a new pattern, staying out late like this. The owlets are able to sit up, to flap their wings, peck at each other, even starting to climb the internal ladder. Makes it uncomfortable for parents to sit inside with them. PM, T has dropped with heavy rain to 64 in the afternoon, then up to 70 by dusk. Still raining hard at 8:30. 9:30-45pm another flurry of bug deliveries. F is out and stays out until past 7am; M is already in his day roost. If she is a smart owl she will snag a songbird before retiring. Or maybe she is going to start roosting outside the box. 7:45am, still no F, no M either in his roost. By 8am I hear robin mobbing east of the shop. I went to look and found an owl on the fence, then flew north but in short hops and always low. Is it injured? Is it the male? It finally flew all the way to the driveway north of us, judging from the growing mobbing. I can hear, so faintly, the female’s descending murmur but can’t pinpoint from where. 8:25am, F finally returns. She has nothing to eat, but I think that is because it is so light. I worry about the male; was he the one being chased and mobbed? 8:40am, went out to check and there was the M, back in his roost. 10:10pm. When T gets home, Madame has just finished defeathering a bird, and is starting to feed it to eagerly rasping owlets. Bird is stashed in the back; all the owlets are back there too and there isn’t much for the camera to see. C is still at the opera, so that’s it for observations tonight. 7am, getting late, no deliveries for a long time. F is softly trilling for food from outside the box somewhere. Owlets are quiet but alertly watching the entrance. F came in at a couple minutes past 7am, no food. I still don’t see the male anywhere. Nonstop whinneying by the F, all day. 7:50pm F is out; late mockingbird is singing, doves are settling down. Earlier this evening the high peeping of cedar waxwings was focussed on the tall pecan across the street. 8:12pm, first bug drop, then at roughly 2 minute intervals for the next 15 minutes. That’s all we see tonight, bugs, both parents out. Tiresome diet. 6:50am, F has a slightly bigger than bug scrap, easily consumed. Bird song is increasing, as is the light. M brings a bit but what they all really need is something big. It will be a long day with nothing cached in the box. She, and I, wait…..but there is nothing. Long day ahead. Owlets are very restless—squirmy and vocal, and just plain hungry. Can hear June bugs buzzing and frogs; not hearing katydids or chuck-chucks yet. 7:50pm, Youngsters are totally ready for Mom to leave the box and fetch them something to eat. Male is perched in a hunting pose on the bending jig below the shop steps, being hollered at by a robin. I wonder if he is waiting for a rat to creep out to where birdseed has fallen below the birdfeeder. F is giving non-stop, quiet hunger trills. 7:57pm, F is out! Male is still on the shop steps, w/T watching from the window. 8pm, M, having left the steps and hunted along the neighbors’ driveway to the N, came by with a bug. 8pm – 8:30pm. Insect deliveries every minute or two from one parent or the other. A particularly large moth was delivered at 8:40pm, and for several minutes after, the air inside the box looked like a snow globe, as scales from moth wings wafted through the air. 9:01 Something small and wiggly gets dropped in (by the male ? ); could it be a lizard tail? Insect deliveries continued (katydid at 9:49pm). 10:18pm, a gecko is delivered, and the lucky owlet spends some time choking it down, tail still lashing. 6:49am. Four owlets are alone in the box. They are alert, standing up tall, and for the first time, bobbing up and down like little mushrooms as they stretch taller and then subside. 6:50am, Madame returns to the box, not carrying anything. 6:51am, Monsieur arrives on outside perch and hands a rat in through the entrance. Madame drags it inside and proceeds to breakfast on it with the eagerly rasping owlets. Mid moring; the whitewing dove in the crepe myrtle is feeding her single offspring. The jays in the liveoak are faced with 4 very large and gaping mouths to fill. 7:35pm, F left the box in the rain, so early! Didn’t see where she went. 8-9:30pm, bug deliveries, mostly though the M delivered an earthworm at 8:10pm. F came and went several times. The owlets have been quiet not only past sundown but before, probably b/c they were well fed on cached food in the box all day. 10pm, on average a bug every 15min.